Public construction projects are designed to create a workable combination of visual appeal and functionality. Whether it be a public library, underground transit station, or municipal courthouse, the overall design must meet or exceed criteria specifying user-friendliness, materials durability, and long-term maintenance costs. Natural stone is often used as an accent material for both indoor and outdoor finishing surfaces, and finding a suitable supply of product at an affordable cost is of prime importance to the contractor charged with this specialized installation job. Nalboor Tiles is the online showroom website for natural stone products imported by Stonexchange, a Miami-based tile distributor. Stonexchange manufactures, imports, and distributes top-quality marble, granite, travertine, and ceramic tiles and mosaics, and the company’s bulk delivery operation means exceptionally low wholesale pricing for those needing large quantities of material. We offer what few other natural stone importers can: year-round availability of the most popular styles and color patterns of beautiful marble, travertine, and ceramic tile for public construction in metropolitan areas. Designers and architects do not create blueprints that include materials instructions without figuring the estimated costs. It is never in their best interest to offer a construction contractor a rough draft for a library, office building, or civic center that incorporates the use of overly expensive materials. Instead, they aim to design a structure that is unique, beautiful, and long-lasting while at the same time making it possible for the building to be completed on or under the bid placed by the contractor. This does not mean that premium quality tiles made from natural stone cannot be specified as the preferred building material. Marble, travertine, and even custom-designed mosaics are actually quite affordable so long as these materials are purchased from a bulk-shipment importer. Natural stone is heavy, somewhat fragile, and expensive to ship from manufacturing center to job site. Of course, most public construction projects call for a large quantity of stone tiles. This creates a secondary problem, one that often results in a red-ink bottom line for many installers and subcontractors. The material must be available at a specific time, or at least be shipped in smaller quantities at various stages of construction. Many suppliers of natural stone tile cannot promise delivery at certain times of the year or will have trouble following through on large orders of a specific shade and pattern of tile. Stonexchange owns and operates its own manufacturing centers located overseas. We take raw material from quarries and fashion some of the most elegant natural stone tiles on the market. We import full container loads of product on a constant basis and are able to ship full-crate loads of tile to commercial customers at any time of year. Long before construction begins, bids are placed for the individual project segments. The tile installation contractor hired by the municipal, county, or state government will need to know how much the material will cost far ahead of when the product is actually purchased. Getting a reliable quote is difficult if the contractor works with a reseller, broker, or retail merchant. The reseller or broker purchases large amounts of certain tiles based on the price fluctuations within the market. The retail merchant generally does not place large wholesale orders but instead purchases one or two crates at a time to fill requests made by individual consumers. On the other hand, a distributor that also owns its manufacturing facilities can offer year-round price guarantees as well as accurate delivery dates. Even if the order requires a 2- or 3-month lead time for production, cutting and shaping, and overseas delivery, the product will arrive at the job site exactly when the client expects it. Stonexchange has been studying design trends for years, and we have structured our manufacturing operation to meet the demand for certain types of natural stone tiles based on their popularity. For example, beige/cream marfil tile is very much in demand in the southern regions of the United States. White or off-white marble such as Cherokee or Vermont White is often specified for use as a floor tile for municipal buildings and courthouses in various parts of the country. The product line showcased on the Nalboor Tiles website reflects the most oft-requested styles and color shades of marble. The sizes of travertine tiles listed likewise reflects what subcontractors most often require to complete their job. Our beautiful mosaics are designed to meet the specifications given on nearly any design template. In addition to manufacturing and delivering the natural stone products that are most in demand, Stonexchange can also offer these materials at a cost that is far below retail. Although our full line of stone tiles is available for purchase by anyone, commercial contractors needing thousands of pieces delivered in several containers will realize the greatest cost savings. We import material in huge quantities, and the cost savings we enjoy through our bulk-import method are passed along to those who need thousands of tiles to fill a single order. Our line of marble tiles includes every one of the popular color shades. Stonexchange manufactures tiles made of raw material taken from several different geologic formations. Everything from white marble with gray streaking to dark red marble with gold or tan veining patterns is available. The Nalboor Tiles website features each one of these products along with a bulk-order price estimate. Bianco Dolomiti is one of our most popular marble tile shades. This product is off-white with thin gray streaking and is perfect for any installation project calling for the use of Calacatta or similar marble. It easily replaces Alabama, Cherokee, Georgia White, or Vermont White. This marble shade is often used as an interior floor tile in municipal buildings and courthouses, and the color tone is similar to what is used for off-white stone columns. Vanilla Oro is a creamier off-white marble, popular for use as a flooring surface. Crema River and Crema Bella are slightly darker and milkier, and both styles work very nicely when complemented by a combination of light and dark accent materials. Our marfil tone floor tile is cream/beige with lighter veining patterns, similar to the popular Bursa and Botticcino shades. Our red marble tiles come in several styles and have pronounced gold, brown, or off-white streak patterns. All of these styles are available in several different square and rectangular sizes. Custom orders for non-standard sizes can be manufactured upon request, and our company does not charge an extra fee for custom-sized floor tiles. Prices vary depending on the amount of product ordered. 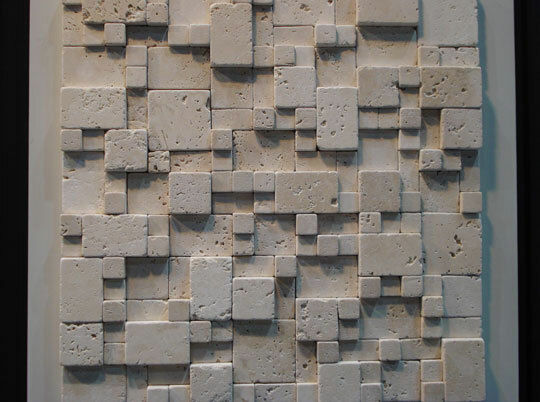 Stonexchange manufactures top-quality travertine tiles in several different sizes. Travertine is used whenever a classic, Romanesque look is desired. Although brittle-looking, travertine is very durable. When properly honed and filled, sealed and coated, travertine is quite water-resistant. This material is used for both indoor and outdoor surfaces as well as for interior walls. Our travertine tiles are manufactured from the highest grade of raw products. Several different sizes and thicknesses are available. Standard-size rectangular tiles are usually offered as full-crate or full-pallet orders, and the price for bulk orders is generally less than $2.00 per square foot. For public recreational facilities developments, building instructions often call for colorful wall mosaics. Construction of public swimming pools often involves the hiring of a specialized tile installer. Stonexchange manufactures and distributes a full line of marble, travertine, glass, ceramic, or combination mosaic tiles. We also carry a line of top-quality pool copings and specialty outdoor ceramic tiles, both of which are offered at rock-bottom wholesale prices when ordered in bulk. Depending on the type of public project, natural stone tiles may be just one of several different materials needed by the subcontractor. Our company specializes in bathroom walls surfaces, window sills, and floor thresholds manufactured at our overseas fabrication centers. These products are made from material taken from the same quarries that produce stone for our exceptionally well-crafted floor tiles. Our sills and thresholds are available in marble, travertine, granite, and engineered stone. Stonexchange keeps a large inventory of material on hand throughout the calendar year. We import product in amounts that equal the size of the orders leaving our distribution center. However, large orders of floor tiles place by our commercial clients often require us to have the material cut and shaped overseas and sent directly to the job site. This means a lead time of up to two months, but these custom orders for full container loads are actually priced lower because of the amount of material being purchased. All customers enjoy a price break when dealing with Stonexchange. Large-scale public development projects in metropolitan areas generally require a substantial amount of product. This is where Stonexchange can help keep the materials costs well within budget. Find out how much you can save when ordering premium quality natural stone tiles. Contact us today and ask about our dependable delivery system, wholesale pricing, and specialty products made from natural stone. Saving money on the finest stone tiles available is your top priority, and getting these products to you when you need them is our top priority. White to light gray backround with gray and yellow veins polished porcelain tile.